Video is the rising star of content marketing. In our survey with the CMO Council, 79% of senior marketers say video’s role will increase in overall visual content strategies. And since we all carry powerful cameras in our pockets every day, content marketers have no excuse not to experiment with video. Not every video can be shot on your phone, but authentic, timely video can have a high impact even if its production quality is lower. It requires little financial investment, has a short learning curve, and offers high potential return. The key here is speed: Quality phone videos are a perfect fit for sharing stories in the moment. 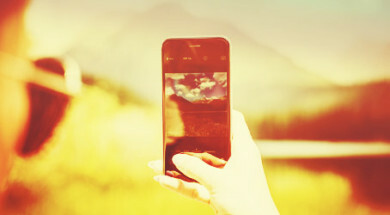 Here are three tips for creating effective video content in a flash using your phone. If you want to turn video around quickly, take your time while you’re shooting so your edit is easier. Make sure to get enough footage but not so much that it is impossible to sort through all the clips to quickly find the best one. A few long, steady shots are better than a ton of shaky, short clips you can’t use. TIP: Hold the camera shot longer than you think you should. Clips always feel longer when you’re shooting than they do in the edit bay. Don’t forget to differentiate your shots. In the heat of the moment, it’s easy to get caught up in the action and record everything from the same angle. Remember to think about the editing process as you’re shooting. You will want wide shots of the action as well as tight cutaways so you can avoid jump cuts (a transition between two shots that are too similar, making it look like the subject is jumping from one position to another). Hold your phone at the eye level of your subject. Position the subject on one side of the frame and ask the person to look at you. To create this shot, I’m holding the camera in my right hand and standing to the left of the camera. My subject is looking across the frame to have eye contact with me. 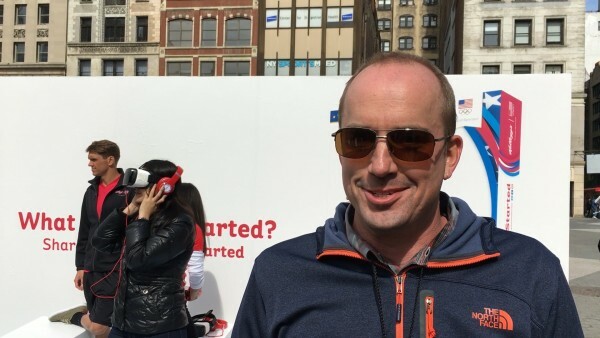 Check out the full video shot on phone that includes this interview with Aaron Noffsinger on the Kellogg’s #GetsMeStarted activation. Ask open-ended questions rather than yes-no questions. Questions that start with “Tell me about …” or “Why …” elicit more detailed answers. They allow the interviewee to describe the story on camera. As you’re shooting, listen for soundbites and stop after you have two or three good ones. This will help you edit faster because you won’t have to sift through a long interview. Your post-production workflow should be as seamless and fast as possible so you can publish your content while it’s still relevant. When I shoot video on my phone, I send clips directly to my team’s visual media library so it’s archived and accessible for everybody to use. Then, I download the clips from the library to my computer and edit with Adobe Premiere. This workflow is the key to a fast edit — I can hit upload as soon as I finish shooting and my clips are ready to edit by the time I get back to my desk. I like Premiere because it has a user-friendly interface and gives you more control over your content. If you are new to video editing, you can also use apps like iMovie or Magisto. The iPhone-shot video for Kellogg’s as it appears in the editing stage using Adobe Premier. The 2-minute, 30-second video was edited and published in one day. TIP: If you are editing video for your blog, edit the clips into a one- or two-minute story. Standard news packages run about one minute and 15 seconds. Write complementary copy to share context or insights you didn’t capture on video. Share short clips on social media with the blog link to drive traffic to your post. Remember, you’re not editing a documentary or a video for your website’s homepage. Video shot on your phone is intended to be short, compelling, and published quickly. If you plan properly, shoot efficiently, and edit properly, you will be able to produce content that’s more timely and be a valuable contributor to the growth of video in marketing. How do you use your phone to shoot video content?